REMINDER: This contest is coming up quickly, so tell your students and/or peers! Open to all students, undergraduate or graduate, anywhere in the world. First entries possible April 15, 2018; deadline May 31, 2018. CID has organized its first ever video competition, open to students enrolled in any college or university during the 2017-2018 academic year. Entries will be accepted April 15-May 31, 2018. One winner will receive a $200 prize. The top entries will be posted to the CID YouTube channel, and be highlighted on the CID website, along with posts describing the creators and highlighting each of their videos, throughout the rest of 2018. Submissions will be evaluated based on originality, clarity, cultural message, effective use of technology, and overall impact. Feel free to work independently or in groups. Get creative, show off your skills and, most importantly, have fun! CID Video Competition: What does Intercultural Dialogue Look Like? WARNING: Please read the entry rules carefully! Several submissions have not met the requirements, and cannot be considered for a prize until they are revised. Make sure you submit a video file (not audio), that is between 30 seconds and 2 minutes (not 30 minutes! ), with the last line “Intercultural dialogue looks like…” and upload it to the server provided (not to YouTube directly). Final deadline is May 31, 2018, at midnight (east coast US time). NEW Clarification: When someone asks “Intercultural dialogue looks like…” in English, the “…” (read out loud as dot-dot-dot) means your job is to complete the sentence and include your answer as the last shot in the video. (So, “intercultural dialogue looks like a tiger, an ice cream cone, a braid, etc.” – choose whatever image makes sense given your video.) Please do NOT include the literal phrase “Intercultural dialogue looks like…” as the last shot in your video! Author Center for Intercultural DialoguePosted on November 13, 2017 June 23, 2018 Categories CID Video CompetitionTags Center for Intercultural Dialogue, CID Video Competition, intercultural dialogue3 Comments on CID Video Competition: What does Intercultural Dialogue Look Like? Recent events suggest that the world needs more people to listen to one another and to think about what they share rather than quite so many people ignoring one another, or making false assumptions about others. We must spend more effort promoting social cohesion (that is, emphasizing similarities across group boundaries) rather than leaving uncontested the frequent assumption that all cultural others have different agendas and share few of our values. Intercultural dialogues are often assumed to require substantial effort in terms of organization, and to involve a lot of people having multiple interactions over a long period of time. This is certainly one model. However, many people have at least brief intercultural dialogues frequently, and easily. The goal of this new publication series is to invite a wide range of people to tell the story of a time when intercultural dialogue occurred, whether it was of the short and easy variety or the long and structured variety, providing models for those who do not frequently participate in intercultural dialogues. In either model, intercultural dialogue is jointly constructed by participants, requiring cooperation to engage in new and different ways of interacting. It is more important to start from a position of curiosity and a willingness to listen than it is to undergo formal training (although at least some instruction or guidance is always useful). Many of the people affiliated with the Center for Intercultural Dialogue consider themselves to be interculturalists. Many have lived and/or worked in multiple countries, speak multiple languages, and/or study intercultural interactions generally, if not intercultural dialogues specifically. The goal of this new series is to harvest the knowledge gained by this group and share it publicly. • Context – How did this episode come about? Who was involved, in what circumstances and location? What started the dialogue? Where did it happen? • Description – How did the events unfold? Thinking now about what happened, what were the key parts of the process? Any interventions? Any sticking points? • Dialogic features – What made it dialogue? That is, how was it different from ordinary conversation, what stood out as noteworthy that might be replicated in future? • Lessons learned – What make it work as dialogue? What things could have been done better? What lessons would you pass on to others? If you are interested in writing up a case study for this series and have previously published with the Center for Intercultural Dialogue, just write it up and send it in. If you have never published with CID, it might be best to first send a note introducing yourself, and briefly explaining what it is you would like to write about, receiving approval before you take the time to write. As with Key Concepts in Intercultural Dialogue, this new series will not be subject to blind peer review, but rather will be accepted at the discretion of the Director. The logic is that these are not major research publications, but rather small notes intended for quick publication. No one is likely to earn tenure on the strength of such publications as these, but they have a different goal, that of sharing information rapidly and widely. • These case studies should be based on personal experience. • These should be written clearly using a minimum of jargon or technical terms, so that anyone can understand them, without quotes, footnotes, or references. Instead, the focus is on describing your own experience. • Case studies should be 1-2 pages long, and will be edited and formatted to a common template prior to publication. • Please use the section headings indicated in the outline above. • On confidentiality: there’s no need to provide other people’s real names if that’s not essential to the story you’re telling. • On copyright: authors retain copyright of their own work, and may publish in another format in future. • If you have other questions, just ask. These case studies will be published in English. However, given that translations of the Key Concepts in Intercultural Dialogue have received so many views, anyone who wishes to translate their own narrative into another language (or two) is invited to provide that as well, or to send a note explaining that it will follow. If you want to volunteer to translate others’ case studies into a language in which you are fluent, send in a note before starting, just to confirm no one else is working on the same one. Thank you for taking the time to share your experience and knowledge. NOTE: The series has now started, and is to be found under Publications in the top menu; a direct link is here. On October 21, 2014, I presented “Ambiguity as the Solution to the “Problem” of Intercultural Weddings,” at Royal Roads University, located in Victoria, BC, Canada, as one of two talks during a fall trip there to meet with students and faculty in their Master of Arts in International and Intercultural Communication (MAIIC). (Further information about that visit has already been posted to this site.) A videotape of excerpts from that talk is now available on the Center for Intercultural Dialogue’s YouTube channel. My thanks to the faculty for the invitation to visit, and to the technology department for videotaping the event. The National Communication Association 100th convention was held in Chicago November 20-23, 2014. I organized a panel entitled “Intellectual Genealogy: Documenting Invisible Colleges in the Age of Digital Communication” with Theresa Castor, Robert Craig, Jay Leighter, Jefferson Pooley, Michelle Scollo and Leah Wingard. In addition, I presented two papers. “Taking a (Meta)Communication Perspective to Intercultural Dialogue” (discussing the Key Concepts in Intercultural Dialogue) was part of the panel organized by Richard Buttny resulting from the Macau conference in spring, with Todd Sandel and Sunny Lie (from that event) and the added participation of Don Ellis; Cynthia Gordon was chair. “Bringing Intercultural Dialogue to the Center” was part of a panel of past chairs of the International and Intercultural Communication Division, organized by Alberto Gonzalez, and titled “Past Challenges, Present Victories.” A photo from that event is attached; the participants were (bottom row, from left): Mary Jane Collier, Wendy Leeds-Hurwitz, Young Yun Kim, Yolanta Drzewiecka, and (top row, from left): Benjamin Broome, Carley Dodd, Donal Carbaugh, and Alberto Gonzalez. In addition, I met with several of the CID advisory board members (Donal Carbaugh, Todd Sandel, and Charles Self). And, as is always the great benefit of large conventions such as this, I caught up with literally dozens of people I know. Far too many to name, this group included not only everyone on any of my panels, but graduate school peers and former colleagues; large numbers of professional colleagues from various contexts, including prior conferences large and small; NCA officers past, present, and future; and even a colleague met in China attending his first NCA. I also caught up with my Villanova University colleagues from last year, this year’s Harron Chair (Raymie McKerrow), several people considering applying for next year, and a former graduate student who was presenting a paper prepared for my seminar in Social Construction Theory. Perhaps my favorite part of going to such conventions is that I also always meet lots of new people. Unfortunately, only one other photo will have to represent all these connections: the second photo above shows me with Jing Yin and Yoshitaka Miike. Beyza Björkman is Associate Senior Lecturer at Stockholm University, Department of English, Centre for Academic English. Since 2005, she has been doing research on the use of English as the medium of instruction in Swedish higher education. Her general research interests include the use of English as a lingua franca (ELF) for academic purposes, spoken academic discourse in general, academic literacy, linguistic equality, language change and language policy. Her most current research on ELF focused on the pragmatic aspects of English as a lingua franca as the medium of instruction, focusing on polyadic lingua franca speech in student-student interaction. More recently, she has published on language policy work at Swedish universities, focusing on actual language practices vs language management issues, as well as attitudes towards the use of English in Swedish higher education. She is currently doing research on the spoken genre of PhD supervisor-PhD student interactions in supervision meetings. 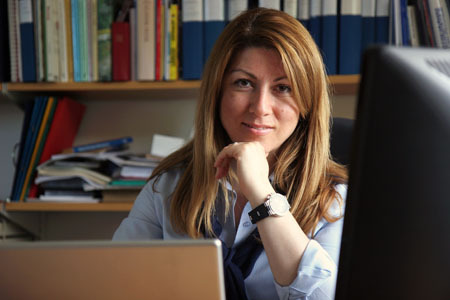 For more information on Beyza’s research and publications, visit her website.